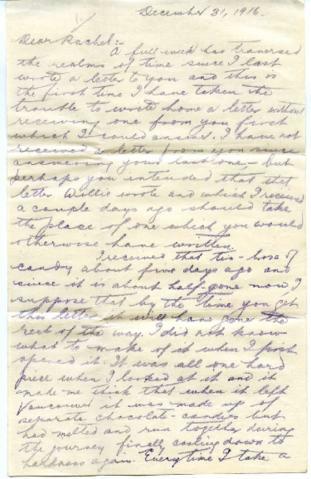 Letter from Private Edward Joseph Seidelman, dated December 31, 1916. Sent from Seaford, Sussex, England to Rachel Seidelman of Vancouver. Private Seidelman writes that he is still in quarantine. In addition, the letter mentions another letter to Harry Dalkin, and Private Seidelman specifically talks about how mail from Europe to North America is censored.